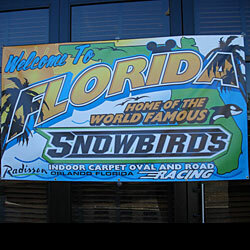 I’m in Orlando Florida for the 15 annual running of the Trinity Snowbird Nationals. I’d love to tell you that it’s warm here but it’s not. Thank god the races is held inside the Radisson hotel because it’s in the 50s outside. There are over 575 racers here fighting for that number one spot on the podium. The number of attendees are down slightly this year due to the Euro Nats going on this same weekend. There are plenty of racers here to fill up the 11 road course classes and the 10 oval classes. Once again the guys who put this great event are organized and the races are running very efficiently. That’s very important when you have that man classes and racers. The track was open on Tuesday and Wednesday starting at 5am for open practice and qualifying started on Thursday with 2 rounds of road course and 1 round of oval, on Friday there was 1 round road course and 2 rounds of oval, and today is a little different with 1 round of road course and 1 and the B mains in both road and oval finished up each because some of the top guys in each B-main will bump into the A-main. This will give them time to work on their cars for tomorrow. It’s very easy to keep track of what’s going on. 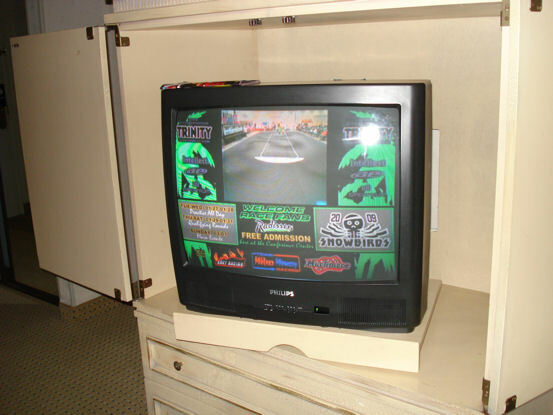 Racers who are pitting in their room can watch and listen to the race on their TV, you can keep track of the action on the Snowbirds website, and of course if you’re at the track the announcer tells you everything you need to know. 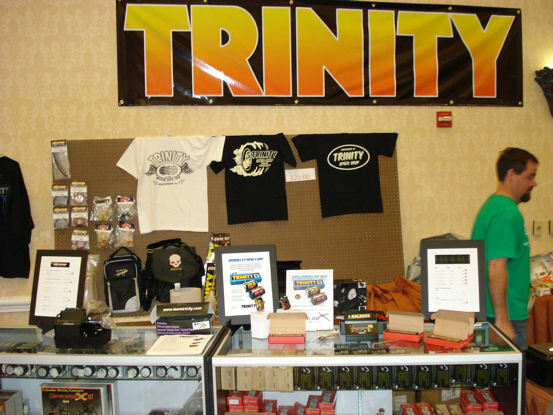 Trinity is the primary sponsor of this race and they have a small store setup at the track so that racers can pick up a few items. 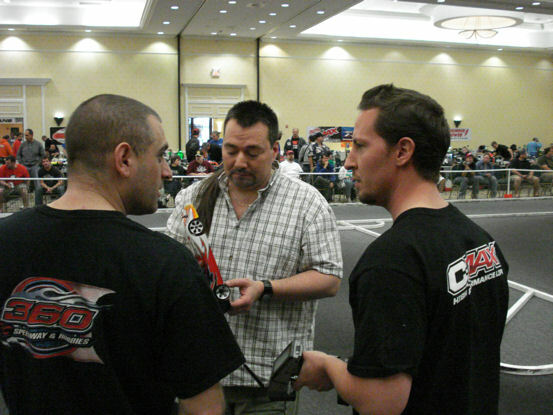 Speed Merchant’s Bruce Carbone (center) talks to his driver Mike Dumas (right) about the last round of 1/12-scale qualifying to see what changes need to be made for the mains. Even the tech guys are organized. You can’t get on the track without making a stop to talk to these guys. 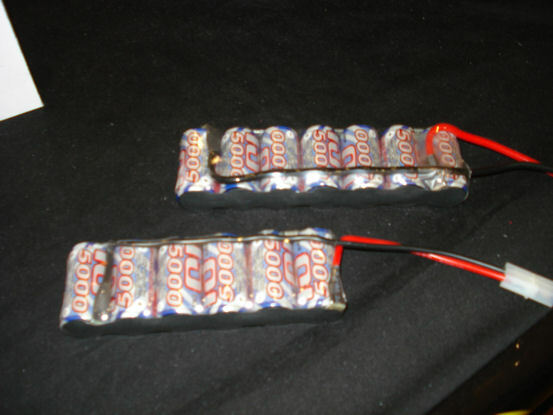 CRC is using a new shock on their 1/12-scale cars this weekend. It’s setup more like an off-road shock where you can easily remove the spring because the bottom collar is slotted and not held in place with a setscrew. 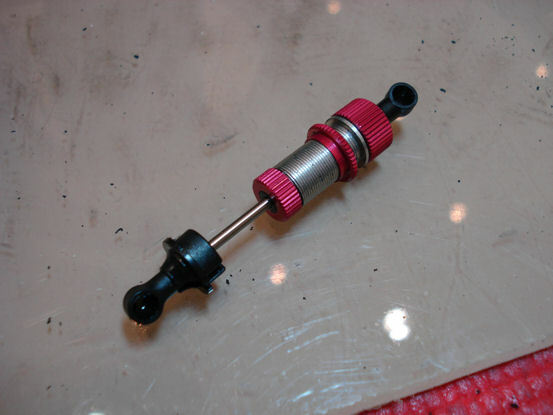 This bladder type shock also has a threaded aluminum body. Another cool item from CRC is this sweet lamp. It uses multiple LEDs to light up your pit space and can be powered by your power supply or you can plug it into the wall. It folds down for compact storage. This is a preproduction prototype and make go through a change or two before hitting the market. 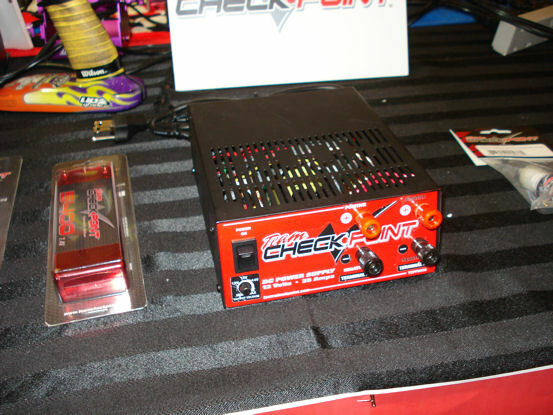 Team Checkpoint has expanded their like with this power supply. It’s a high quality piece that features adjustable voltage and can power two chargers at the same time. You can pick it up for around $79. 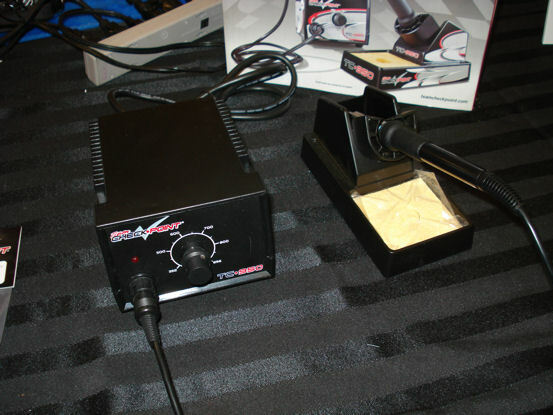 Also in the Team Checkpoint pit was this new soldering iron. You can easily adjust the temperature by way of the large knob on the face of the unit and it heats up quickly thanks to the high quality parts inside. It also comes with a cool Team Checkpoint wrap inside. Just like their power supply, you can pick it up for about $79. Team Associated/Reedy driver Shaun Cochran get’s some tires ready for the last round of Oval Qualifying. 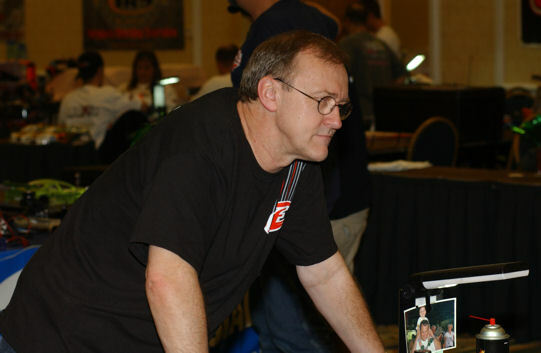 Trinity’s Jim Dieter is on hand to give their drivers all the power they need. This is just a small amount of people in the pits at the Snowbird Nats. The track is loaded with people. You can also find them in a back room, the halls, and in their rooms. Here’s the road course setup. You can easily see the ideal line by the darker sections on the carpet. 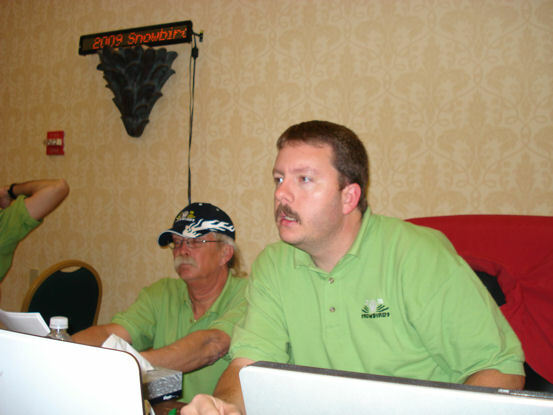 Mike Boylan (right) is the man. This race is his baby and it has been on of the most popular races for the past 15 years. This man puts lots of work into this event and it shows. 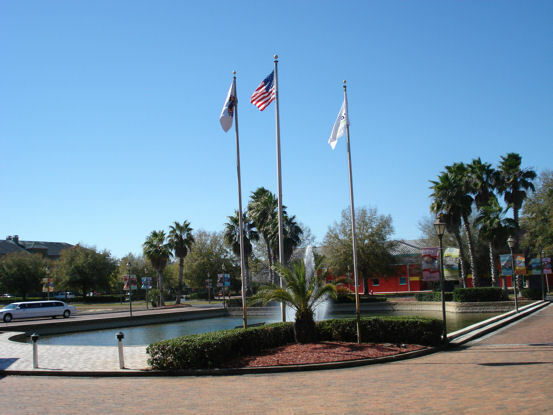 Oval racing is also a big part of the Trinity Snowbird Nationals. 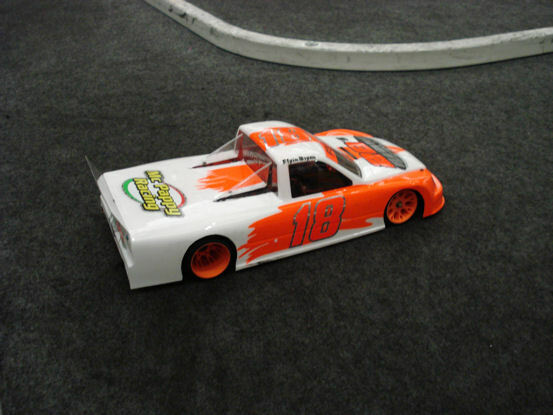 These trucks look so cool on the track. Check out this pit! This guys is really into racing. 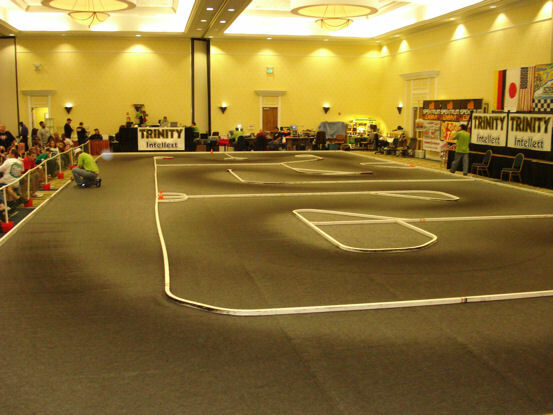 The oval is setup with wide lanes so there’s plenty of room to pass. It sits on the same carpet as the road course. These guys are quick at making the change over. It may look warm outside. It’s not! Once qualifying for all the oval classes was over on Saturday, the track was set up for the Trinity Snowbirds Thunder 600 race. This featured two classes of oval racers who teamed up to run in 600 lap races. 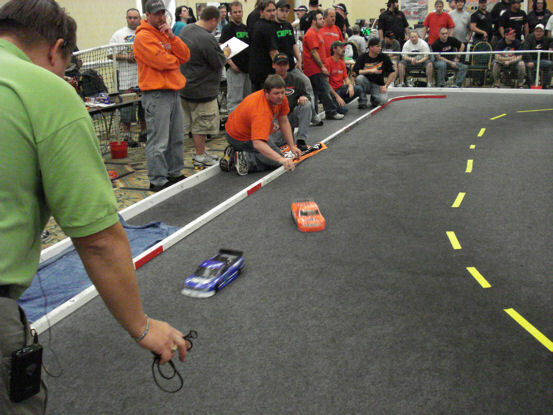 Tables were set up at the end of the track for each group and they set themselves up with tires, batteries, and tools. 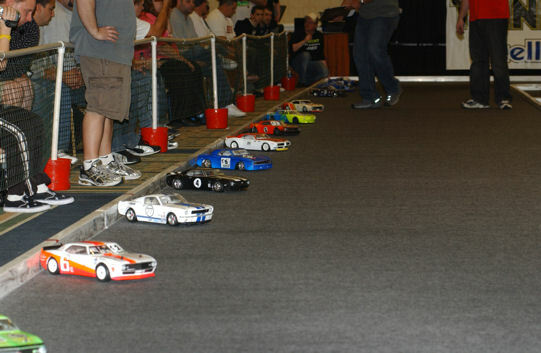 Yellow tape was placed in turns three and four to provide the racers with a pit lane. During the race they came in for battery and tire changes and some just came into the pits for a quick motor cool down. 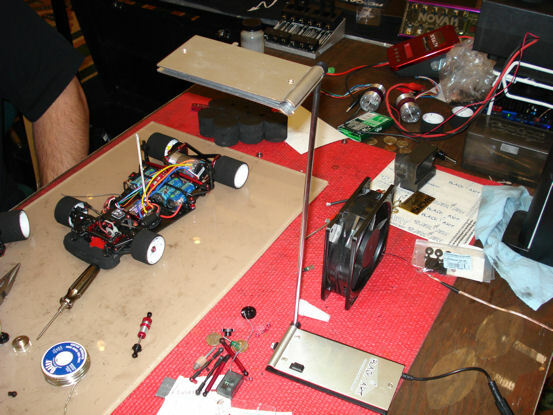 The races were broken down into 300 lapers and the teams were able to make tweaks or fix their cars in between. The crowd and racers loved it. I was checking out some of the new products in the Trinity booth and these 5000mAh battery packs caught my eye. Team Trinity owner Erine Provetti (center) was hanging out with the racers all weekend. They did very well at the race. 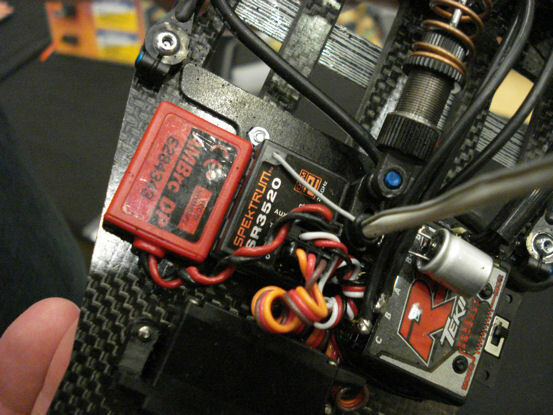 Spektrum RC had their new micro receiver for the DX3R. It’s smaller than a transponder! The Vintage Trans Am class was one of the coolest classes at the race. I wish I had a car to run. 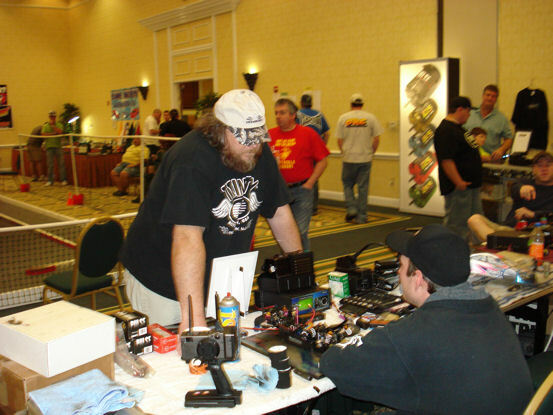 Protoform’s Dale Epp came down to the Trinity Snowbirds this year. He designs some of the fastest bodies around. 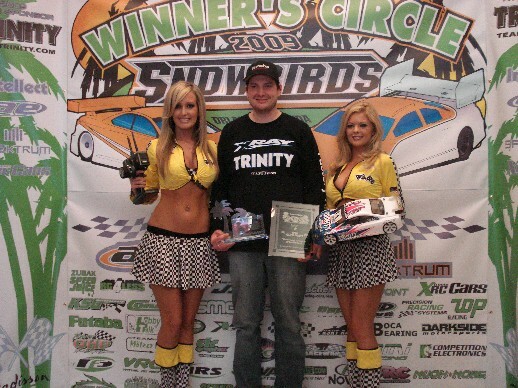 Team Trinity/Team XRAY driver Paul Lemiuex took the win from the TQ spot in the Touring Car Pro Mod main. 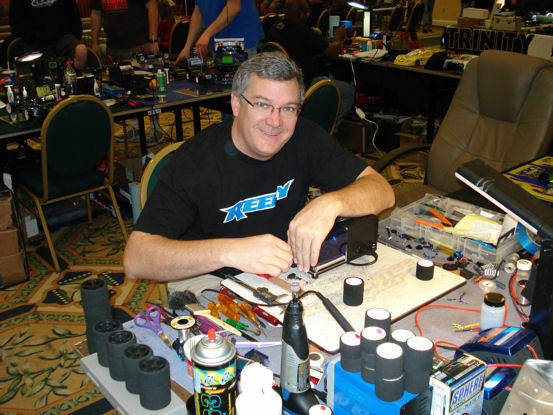 Team Associated’s Mike Blackstock was on fire this weekend. He took home the most wins and the over all win in road course racing. Frank Ulbrik started second in the Pro Mod oval class and worked his way to the front to take home the win.